Despite huge support, drip irrigation hasn’t really taken off in Africa, as I was astonished to learn from Jonas Wanvoeke, who used to work with me at AfricaRice. I had been convinced of the value of drip irrigation. In 2012 we had made a farmer training video on drip irrigation in Burkina Faso, where Jonas later conducted his field research, and the farmers who featured in the video were all highly convinced of the benefits of drip irrigation, and were using it capably. Jonas’s study showed that the projects all had a pro-poor focus and were often promoting low pressure kits to irrigate relatively small plots. The technology was always provided by a project without really involving the private sector in Africa. The projects ensured that boreholes (water wells) were installed and organised farmers to work in groups to manage the kit. Apart from farmers supported by projects, like the ones we filmed, Jonas found that hardly any one used the drip irrigation technology in Burkina Faso, despite two decades of project interventions. Perhaps the problem with drip irrigation was not the technology itself, but how it had been promoted, as suggested by a recent experience in Benin by Gérard Zoundji, who is currently doing his PhD on communication. With support of Access Agriculture, Gérard embarked on action research; farmer training videos on vegetables were translated into local languages and compiled onto a DVD. One of the videos happened to be on drip irrigation. Gérard sold the DVDs at a subsidised rate to agro-dealers and to people who sell entertainment videos. On a note inside the DVD jacket, Gérard printed his phone number so that people could call to ask questions. Within three months nearly 400 DVDs had been sold and people were contacting Gérard from as far away as Niger, Nigeria and Ghana. The DVDs were travelling widely, almost under their own power. On the other hand, when NGOs distribute training videos, almost all of the DVDs stay in the villages that get them. The farmers who bought the DVDs called Gérard to ask where they could get more videos and where they could get the drip irrigation equipment. Farmers were interested in drip irrigation after all. As projects gradually come around to the idea that they should work with the private sector instead of avoiding it, they need to understand that handing out gifts to farmers is often counter-productive. The private sector has a role to play, both in selling the hardware and in teaching farmers how to use it. Last week, Gérard shared with me some photographs from a farmer in coastal Benin who had watched the videos. 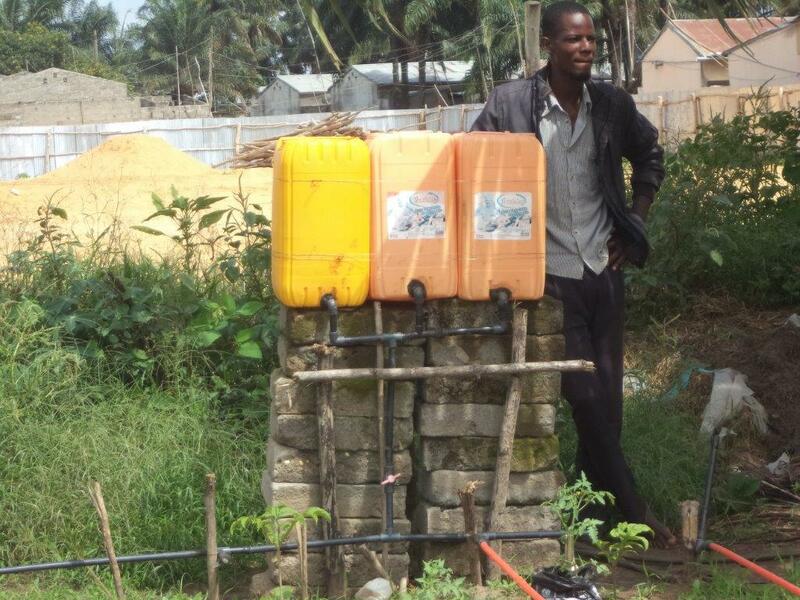 The farmer had made his own drip irrigation kit using buckets and some old hoses that had served to irrigate the intensive peri-urban vegetable gardens around Cotonou, Benin. Projects promote drip irrigation to save water, but in southern Benin water is plentiful, and available in shallow wells. Here individual farmers like drip irrigation to save time and labour. So even without the handsome drip irrigation kit presented in the video, farmers see the value of it, and will make the concept work using their own resources. As we often say in this blog, if a video conveys the basic principles that underlie a new technology, the farmers may invent a different way of using the idea. Projects prefer working with groups of farmers, which only functions when the project is there to hold the group together, but drip irrigation is a technique for intensive agriculture, best managed by a household. Development projects offer room for farmers to experiment with novel technologies, like drip irrigation, and working in groups may be the easiest way for the project to get a critical mass of farmers together, and to start engaging with the private sector. In a second step, well-made farmer training videos can help to share the innovations with many more creative farm households and to enable the private sector to expand its products and services. The video Drip irrigation for tomato was made for the International Fertilizer Development Center (IFDC) and can be watched and downloaded in 26 different languages from the Access Agriculture website, along with many other training videos. Wanvoeke, J. 2015. 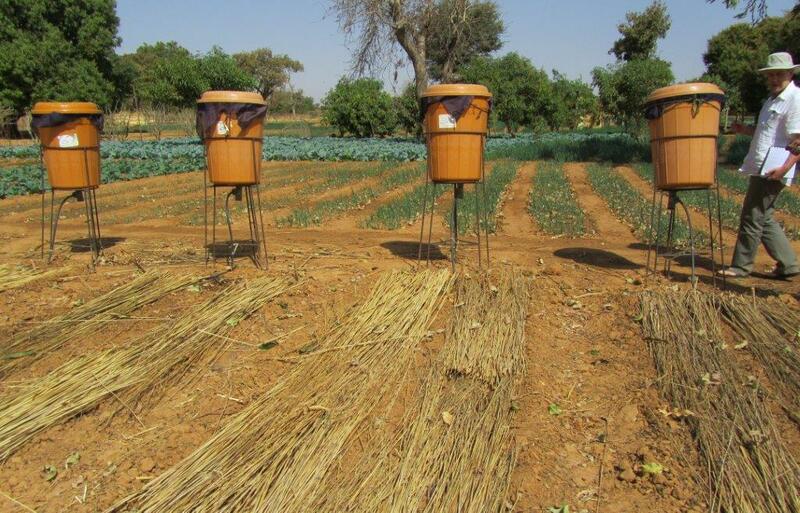 Low cost drip irrigation in Burkina Faso: Unravelling actors, networks and practices. PhD thesis, Wageningen University, Wageningen, Netherlands. Zoundji, G. 2016. Farmers pay for learning videos. In: Bentley, J., Boa, E. and Mundie, S. (eds). A Passion for Video. CTA: Wageningen, in press.